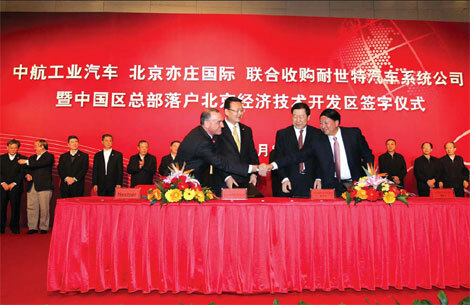 BEIJING - In the largest-ever Sino-US deal in the auto components industry, China's State-owned parts manufacturer AVIC Automobile Industry Holding Co Ltd recently became the majority stockholder in Nexteer Automotive, the Michigan-based maker of steering and driveline systems. AVIC Automobile aims to boost China's auto parts sector by taking over competitive counterparts overseas, said Lin Zuoming, general manager of the Aviation Industry Corp of China, its parent company. Nexteer is the world's third-largest company in sales of driveshaft components and the fourth-biggest for steering systems. It had more than $2 billion in revenue last year. According to Nexteer, it has 20 manufacturing plants, three engineering centers, two test tracks and 11 customer service centers in seven countries. Its customers include General Motors, Ford, Chrysler, BMW, PSA Peugeot Citroen and Fiat. According to Robert J. Remenar, president and CEO of Nexteer, only about 10 percent of its global revenue was generated from China last year. "And that's why the acquisition makes very good sense," Remenar said, noting that the deal should boost Nexteer's growth in the fast-growing market. Remenar is confident about the future in China as the market is huge and the industry is converting from hydraulic to electric power steering, a core business of Nexteer, due to its energy and fuel efficiency. Remenar expects that in the near term 50 percent of steering systems will be electrically powered. He said that Nexteer plans to set up three facilities in the Beijing Economic and Technological Development Area in the next two years, including its Chinese operational headquarters, an engineering center and a manufacturing center. In the next few years investment in the Nexteer project is expected to reach about $300 million, said Zhao Guibin, board chairman of AVIC Automobile and Nexteer. Last November, Nexteer was bought from General Motors by Pacific Century Motors (PCM), a joint venture majority owned by the Beijing E-Town International Investment & Development Co Ltd, the financial and investment arm of the Beijing municipal government. AVIC Automobile then acquired a 51 percent stake in PCM in March, becoming the controlling stockholder in Nexteer. Beijing E-Town and its partners own the remaining 49 percent. Zhao said that PCM paid more than $400 million to buy Nexteer but refused to disclose the exact number. Zhang Xiaoyu, executive vice-president of the China Machinery Industry Federation, said that AVIC Automobile and E-town's acquisition will contribute to the Chinese automotive industry, which is reliant on a strong components sector. Analysts said that acquiring technologies as well as manufacturing facilities from leading foreign companies is a shortcut for domestic manufacturers to improve their own products, technologies and R&D capabilities. It also helps domestic players tap the international market. Several such deals have been made by Chinese companies in recent years. Private sector carmaker Geely bought Australian automatic transmission maker DSI in 2009. The same year chassis supplier BeijingWest purchased the global suspension and brakes businesses of US parts maker Delphi. Also in 2009, Beijing automaker BAIC Group acquired two car models and related engine technologies from Swedish brand Saab. This February, BAIC Group announced that it bought all equipment and core technologies of Swedish gearbox maker Weigl Transmission for 31 million euros ($44.3 million). Recent media reports said that Dongfeng Motor Corp is in talks with Getrag to buy a one-third stake in the German transmission manufacturer. The reports said that if an agreement is reached, it would be first time a Chinese carmaker acquired the assets of a German automotive company.